PKL Flote - market leader in Latvia! PKL Flote, a member of the Alfons Hakans, group, is a Latvian tugboat company which specialises in harbour and sea towage in the Latvian ports of Riga and Ventspils. PKL Flote has 6 modern and powerful ASD tugs and the entire group owns and operates more than 50 tugboats, barges and workboats. In addition to our core tugboat services, the PKL fleet is used for icebreaking, firefighting, transporting people and small cargoes and for emergency services. 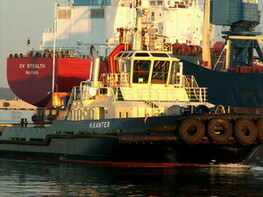 Our well-equipped fleet is suitable for all types of salvage operations. PKL represents quality, crew expertise and use of innovative technology and looks forward to future cooperation with you!